Dry ice is the solid form of carbon dioxide. It is used primarily as a cooling agent. Its advantages include lower temperature than that of water ice and not leaving any residue (other than incidental frost from moisture in the atmosphere). It is useful for preserving frozen foods, ice cream, etc., where mechanical cooling is unavailable. Dry ice sublimes at -78.5 °C (-109.3 °F) at Earth atmospheric pressures. 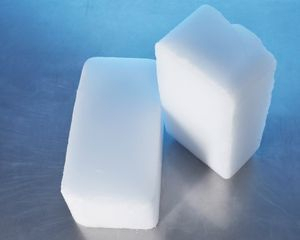 This extreme cold makes the solid dangerous to handle without protection due to burns caused by freezing (frostbite). While generally not very toxic, the outgassing from it can cause hypercapnia due to buildup in confined locations. 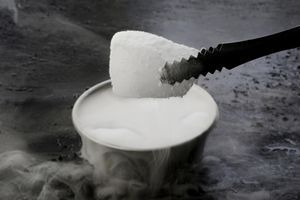 The most common use of dry ice is to preserve food. 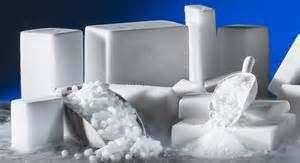 Dry ice can be used to flash-freeze food or laboratory biological samples, carbonate beverages,and make ice cream. 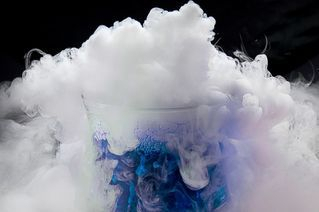 When dry ice is placed in water, sublimation is accelerated, and low-sinking, dense clouds of smoke-like fog are created. This is used in fog machines, at theaters, haunted house attractions, and nightclubs for dramatic effects. Unlike most artificial fog machines, in which fog rises like smoke, fog from dry ice hovers above the ground. Dry ice is useful in theater productions that require dense fog effects.